TNUSRB (Tamil Nadu Uniform Services Recruitment Board), Tamil Nadu, Chennai Invites Online application for 6140 Vacancies for the year 201-2018. TNUSRB TN Police Exam Model Questions and Answers in Tamil PDF Format Download. TNUSRB Model Questions and Answers (Total 100300+ Tamil Questions Answers PDF) covers for the the subjects Indian Polity/Indian Constitution, Indian History, Tamil Nadu History, Indian Geography, Indian Economics, General Science, General Tamil, General Knowledge, Current Affairs for TNPSC Librarian, TNPSC CCSE 4 2017, 2018, VAO 2017, TNPSC VAo 2017, TNPSC Groupm IV, TNPSC Group II, TNPSC Group 2A, TRB, TET, TN Police and other State and Central Government exams. Click the Links below and get PDF Download. 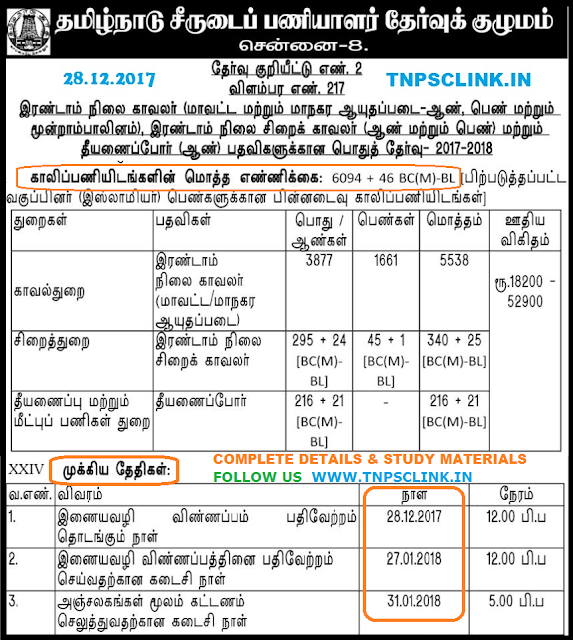 Study Materials for Combined Exams for TNPSC Group 4 and- VAO 2017, TNUSRB TN Police exam 2017, 2018.